Bouillotte (“BOO-YACHT”) refers to a type of card game originating in France in the 18th century similar to poker. The game has spawned two types of furniture: the bouillotte lamp and the bouillotte table. You can see both the table and the lamp in this painting by Jean-Francois Bosio from 1798. 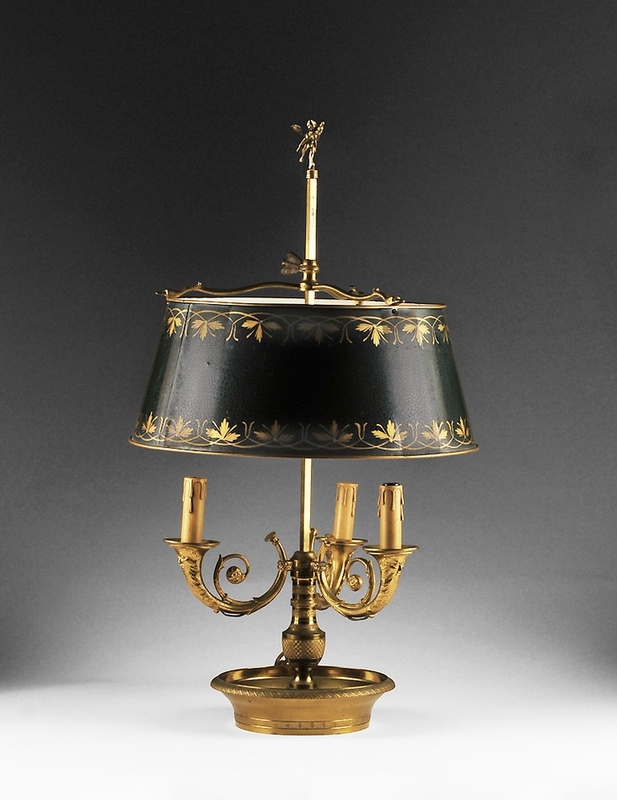 A bouillotte lamp usually has a base of one or several candlesticks with a center post and, often, a tray at the bottom to catch wax. The shade is typically a type of lacquered or enameled metal known as tole (“TOLL”), that could be lowered as the candles burned down. Metal was a practical choice since it wasn’t flammable. Today the lamps are electrified. A bouillotte table is a small table originally used for card playing with a metal gallery encircling the top. Traditionally, the metal gallery held a felt top in place when the table was used for cards.. Often the table top is marble. Usually there is at least one drawer and sometimes a pull-out tray. The table has tapered legs in the Louis XVI neoclassical style, as opposed curved cabriole leg seen in the Louis XV period. The legs frequently terminate in a sabot. When not used for cards, the table is quite suitable as a side table. Photo credits. First image of lamp, and open table from 1st dibs.